Nowrung Khan , a Gandapur chieftain, circa 1867. "The Gundapoors are Soonnee Mahomedans, frank and hospitable, and free from vices and treachery of the Afghans of the frontier. As yet they have not become infected by Wahabeeism, nor the fanatical desire for a holy war; nor do they much affect military service, though well fitted for it both by their spirit and physique"
"Naurang Khan is the leading man among the Brahimzai (Gandapurs), and in consideration of his services during the mutiny (1857's) , has received from the Government the title of Khan Bahadur." 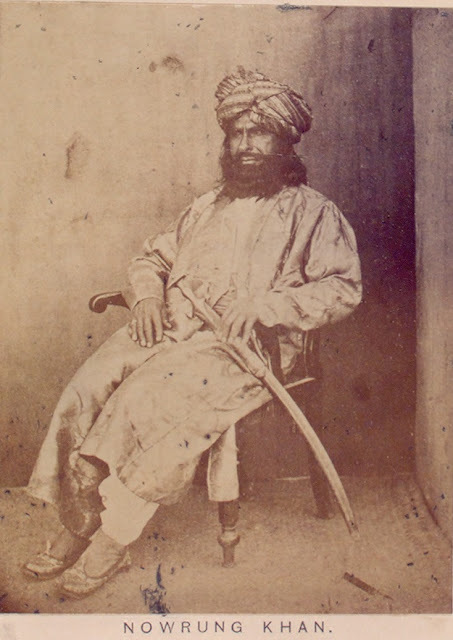 "The title Khan Bahadur was conferred on Naurang Khan on 11th March 1859, as a personal distinction, for very distinguished services during the Multan rebellion and the Mutiny of 1857. Belongs to the Gandapur (Afghan) family of Kulachi in the Dera Ismail Khan district of the Punjab. He raised 50 horse and 100 foot for service in the Multan campaign, and was desperately wounded at that time. At the close of the campaign he joined the Police, retiring on a pension after three years; but continued to volunteer for service on the frontier, and his son, Muhammad Zaman Khan, was killed in this service. 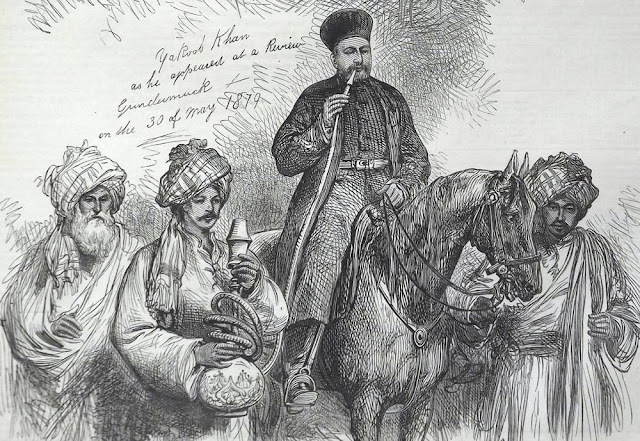 When the Mutiny broke out in 1857 he raised 600 men; and leaving 200 foot with the Deputy Commissioner of Dera Ismail Khan, he joined Sir Herbert Edwardes with the residue at Peshawar, and marched at the head of these followers into Hindustan. He was engaged in the actions against the rebels at Jhelum, Delhi, Najafgarh, and elsewhere; and on one occasion saved Lieutenant Lind's life by killing a Sepoy who was about to bayonet that officer when dismounted. For these services he received a jagir in perpetuity, and the title of Khan Bahadur. His son, Muhammad Zaman Khan, mentioned above, left a son named Bakhtiyar Khan. Another son, Mehardil Khan, has three sons—Faiz Muhammad Khan, born 1862; Sayyid Muhammad Khan, born 1864; Abdulla Khan, born 1866. A third son, Sarfaraz Khan, Risalddr, has two sons—Gulzar Khan and Kunidad Khan . A fourth son, Sikandar Khan, has a son named Samandar Khan.."